The new audio subsystem was designed for excellent performance in office environments. It supports a large range of codecs, wideband audio, handset and hands-free operation according to TIA-920 standard. The specially designed grips which hold and release the receiver compliment overall user-friendliness by eliminating the noise normally associated with lifting and replacing the receiver. For network connectivity, the snom 720 comes with two Gigabit Ethernet ports, one of them suitable for Power over Ethernet. The Ethernet ports are connected to an internal switch that is capable of VLAN tagging, so that an external PC can reside in a different VLAN than the phone. A USB type A connector can be used to expand the functionality of the snom 720. An optional USB stick can be used to connect the phone over Wireless LAN or enable Bluetooth headsets. The 4-line B/W display displays caller-ID and other call-related information. Its fully graphic capability makes it possible to show international characters and render content generated from the built-in mini-browser. Three rows of general-purpose keys with 18 two-color LEDs can be used to implement functions known from traditional PBX systems. Examples include speed dial, busy lamp field (BLF), shared line appearances (SLA), call forwarding, door opening, and many more features depending on the PBX system used. The new foot stand allows two positions for the device (28° and 46° angle). It can be setup and changed easily without tools. The snom 720 comes in a dark grey color that fits the typical office dress code and makes usage traces less obvious than lighter colors. 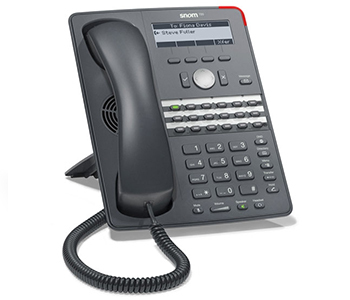 Like all snom desktop phones, the snom 720 comes with software that has been used in many installations over the last decade. Configuration can be done manually through the built-in web server or through automatic provisioning. There are extensive management and reporting tools available, such as RTCP-XR or PCAP. Customization can be done in various ways, such as the snom mini-browser protocol. The phones come with a preinstalled certificate signed by the snom certificate authority which makes it posible to securely provision the phone without manual interaction. In addition to the traditional provisioning mechanisms, it comes with TR-069/TR-111 for easy deployment in carrier environments. Download the YipTel Snom 720 HD Datasheet (PDF).